A demonstration can mean an event where people do something to let others know what they think and to try to change people's point of view. A demonstration is usually considered more successful the more people participate. Demonstration is permitted by international human rights law as the freedom of assembly if done peacefully. 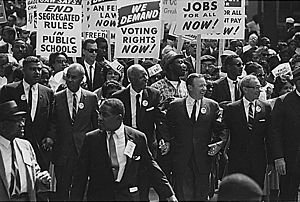 Examples of this type of demonstration include marches and rallies. In 2003 many people demonstrated against the 2003 Invasion of Iraq. A demonstration can also mean when someone shows how to do something, or in what ways a thing can be used. Salespeople often demonstrate things like computers, cars, and televisions to customers so they can make sure the customer sees all the features of the item. "Demo" is short for demonstration, and people often use it to describe this meaning of the word. Demonstration Facts for Kids. Kiddle Encyclopedia.